Moving from one installation to another in the United States can be challenging enough; but moving with your family overseas can be even more complex. One of the most important challenges can be summed up in one question: "Where will my children go to school?" 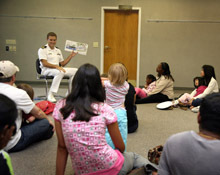 The Department of Defense Education Activity, or DoDEA, operates schools in 11 foreign countries, Guam and Puerto Rico. All DoDEA schools are fully accredited by U.S. accreditation agencies and maintain high academic standards with well-rounded educational programs.